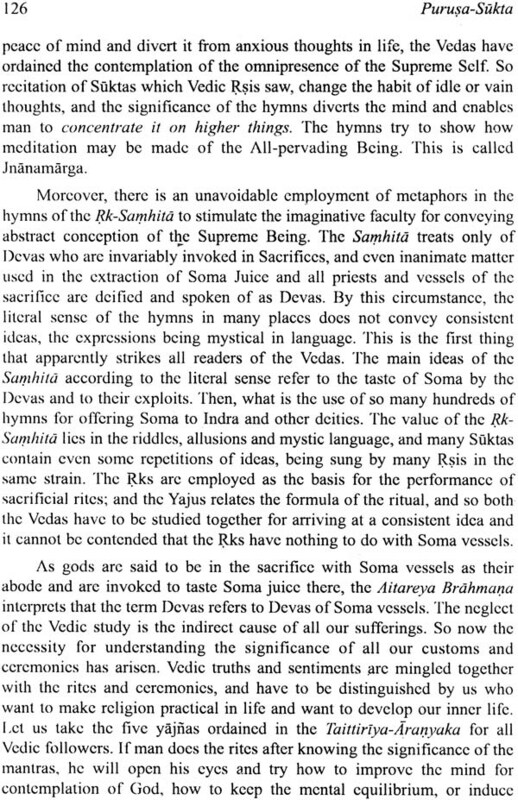 The present volume focuses attention on the most popular of the Vedic hymns, viz., Purusa-Sukta. 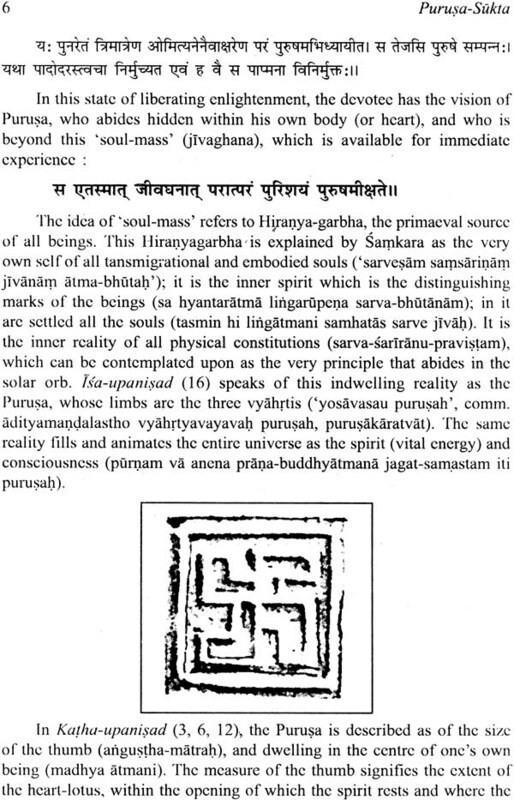 The idea of he Purusa has been explained in some detail and the enigmatic concept of Purusamedha has also been considered in its proper perspective. It is hoped that by presenting this tradition interpretation, many of the misconceptions will be removed. 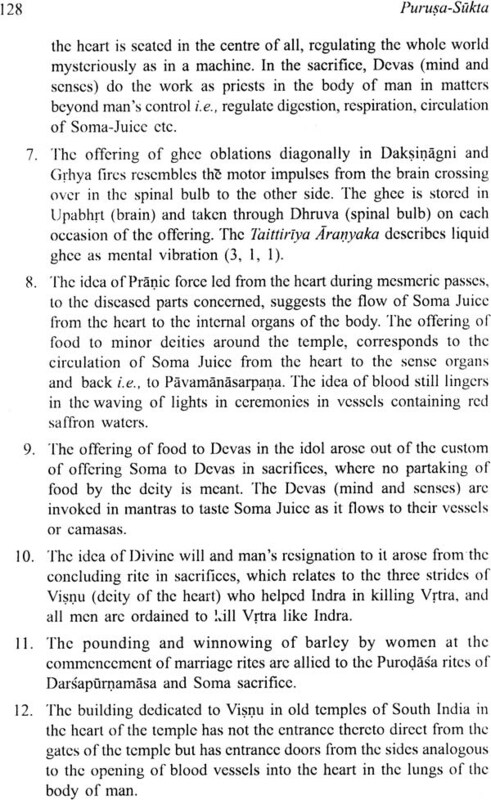 And as an Appendix has been given a detailed symbolic account of the Yajna, prepared by an almost unknown scholar of the previous generation, Srimusnam Narasimhacarya. 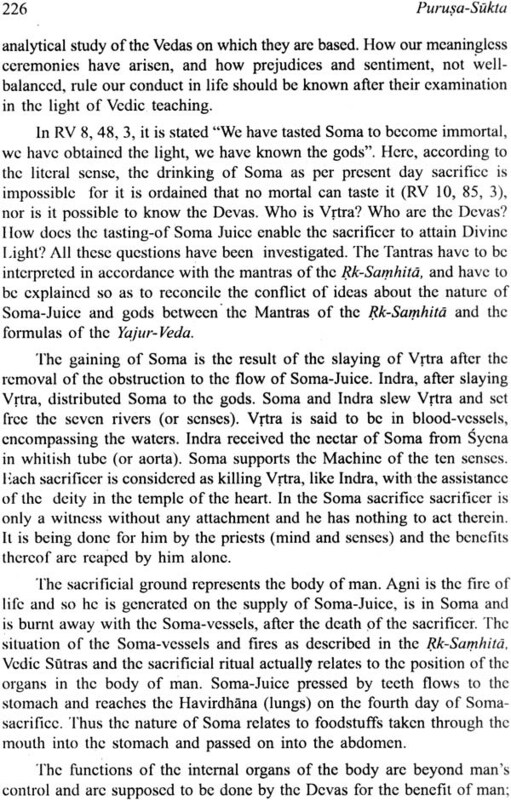 This becomes relevant in the context of yajna, which is the central theme of Purusa-Sukta. While this account may at first glance appear to be a modern reappraisal it accords well with the traditional approach of concentrating on the essentials. The Kalpatharu Research Academy, Bangalore is presenting to the world of scholars and students the Fourth Volume of its prestigious series RGVEDA-DARSANA. 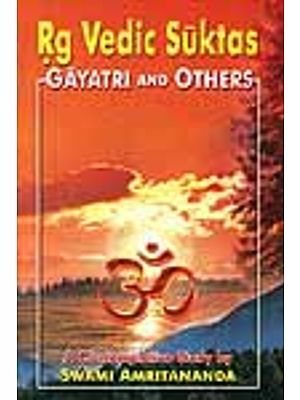 This volume deals with the most important Sukta in Rgveda, namely PURUSA-SUKTA, which has been extensively used in the country in various ritualistic occasions, even to this day. 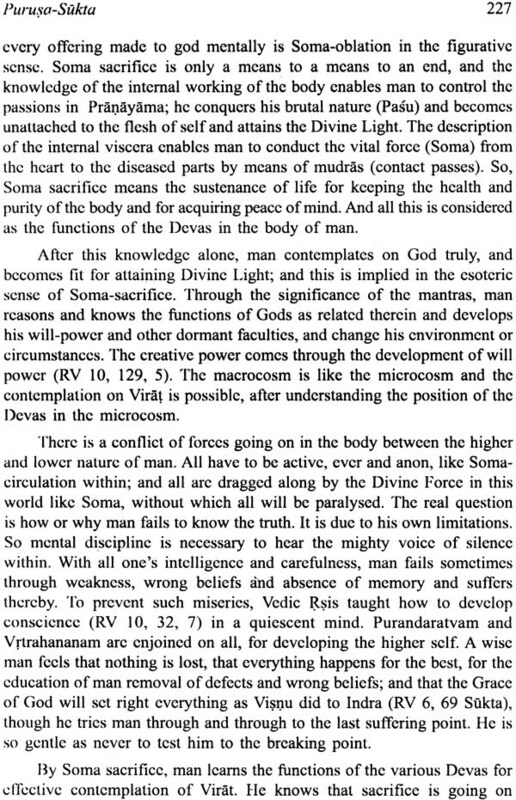 It is for the first time that an entire volume has been devoted to this Sukta: its importance has been highlighted here. 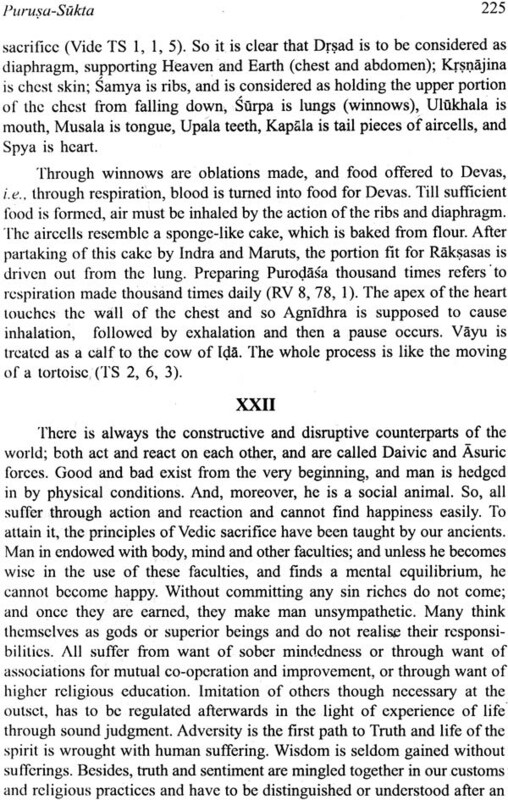 The Academy feels sure that the value of this series of Books on Rgveda would be recognised by the workers in this field as well as pious and interested lay folk. The Academy records its sincere gratitude to the Author of this, as well as the other, volumes in the series, Prof. S.K. Ramachandra Rao, an eminent scholar whose service to the Academy has been most invaluable. ‘[he Academy also feels grateful to His Holiness Sri Bharati-Tirtha Swamiji of the Sri Sringeri Sharads Peetham, who is the chief patron of the Academy Sri V.R. Gowrishankar, the Administrator of the Sri Sringeri Peetham, has been of great help as the Chairman of the Academy and out thanks arc due to him. The Academy also acknowledges its gratitude to the officers of the Ministry of human Resources Development, Government of India, and to the authorities of the Government of Karnataka for their support in our endeavour. The Omkar Offset Printers, Bangalore merit our special appreciation for the excellent manner in which the volume has been produced. 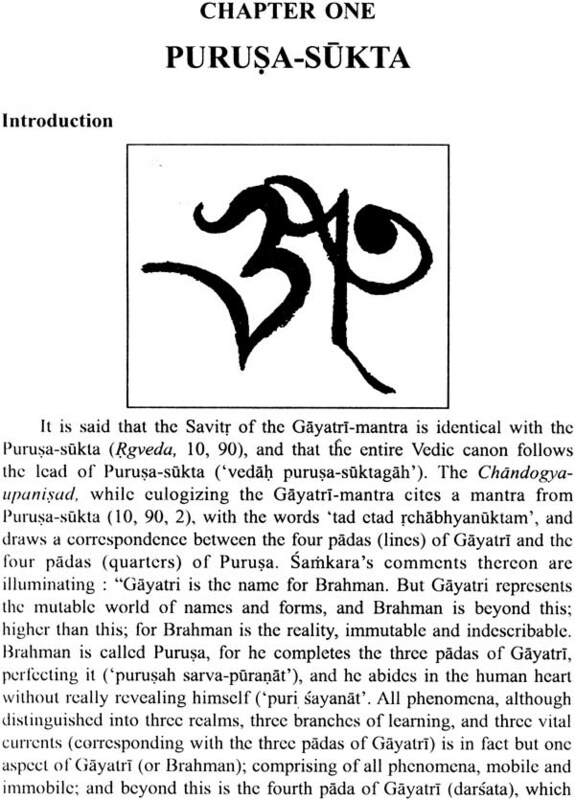 The present volume focuses attention on the most popular of the Vedic hymns, viz., Purusa-Sukta. 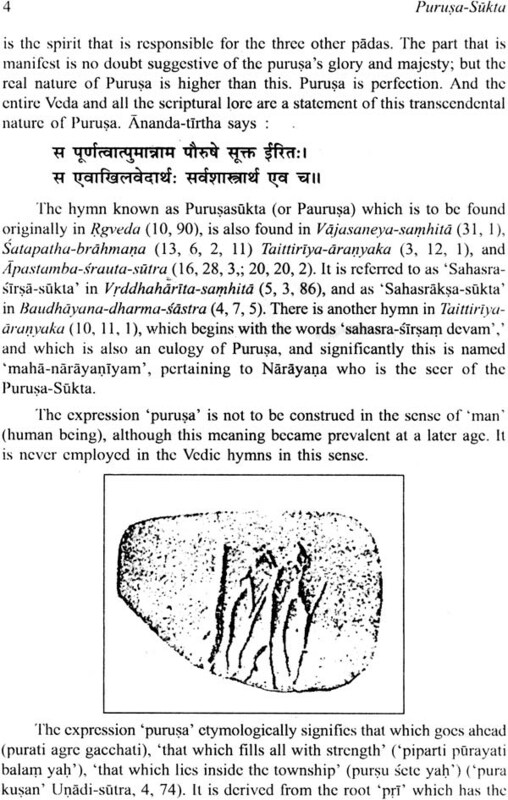 The idea of the Purusa has been explained in some detail and the enigmatic concept of Purusa-medha has also been considered in its proper perspective. It is hoped that by presenting this traditional interpretation, many of the misconceptions will be removed. 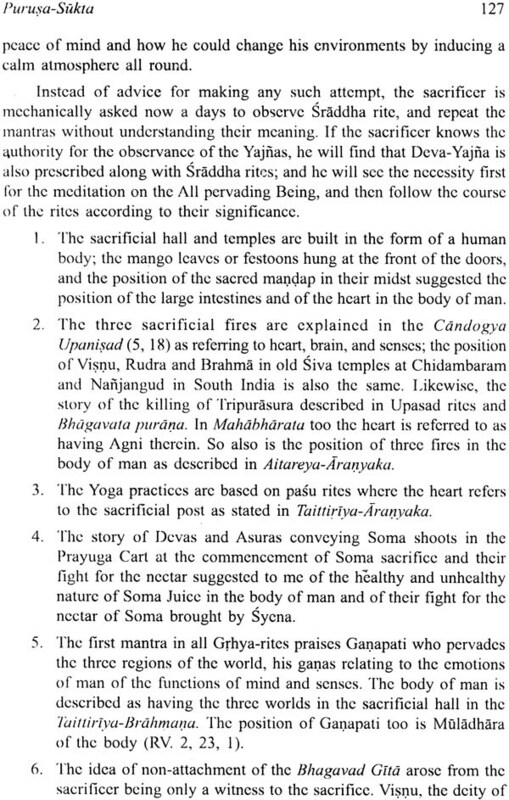 And as an Appendix has been given a detailed symbolic account of the Yajna, prepared by an almost unknown scholar of the previous generation, Srimusnam Narasimhacarya. 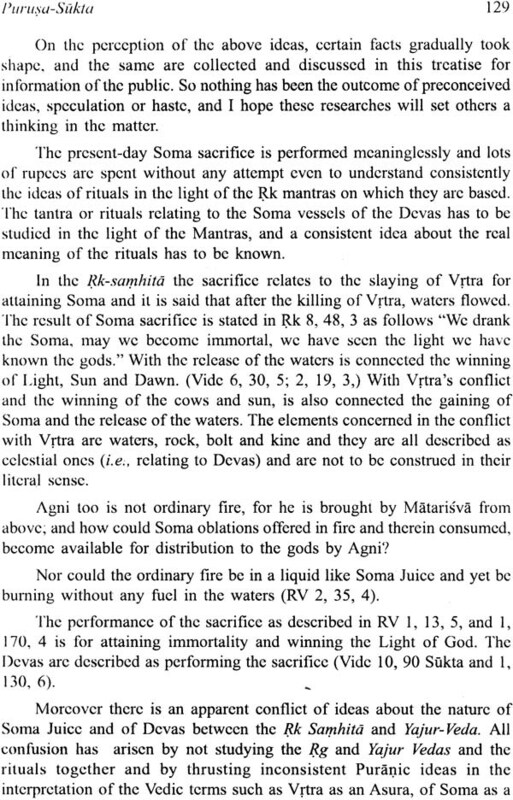 ‘This becomes relevant in the context of yajna, which is the central theme of Purusa-Sukta. While this account may at first glance appear to be a modem reappraisal, it accords well with the traditional approach of concentrating on the essentials.